Kathy Stack is a devoted mother, grandmother and community advocate for health, hunger relief and educational causes. A loyal donor and volunteer for more than 18 years, Kathy chose to include a gift to Second Harvest Heartland in her will. How did she come to the decision to make the move from regular donor to legacy donor? Yet it didn’t happen quite that fast. Kathy did her homework. She took the time to get to know our staff and learn about the programs and services we provide along with the vast network of hunger-relief agencies in Minnesota and western Wisconsin. Kathy also took the time to meet individuals and families at local food shelves. 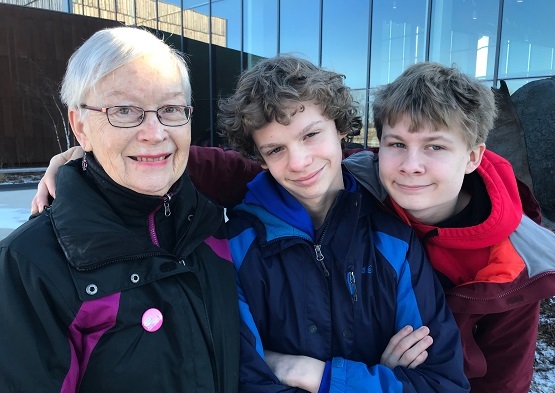 Kathy said one of the greatest joys of her life was introducing her grandsons, ages 12 and 16, to volunteering. You can secure your legacy in a most meaningful way by making a commitment to the long-term stability of Second Harvest Heartland and the people we serve. Using IRAs, bequests made through wills, revocable living trusts, appreciated stock, real estate, mutual funds, securities, life insurance and other giving options, you can ease the stress and worry of hunger for countless people well into the future. Learn more about all the ways you can help.